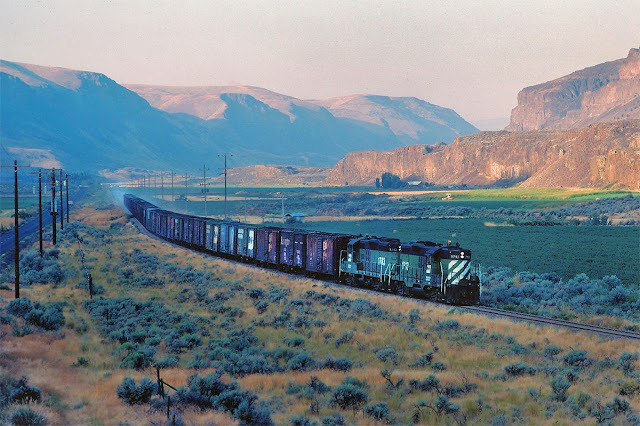 Blair says: "Sunlight hasn't yet reached the depths of Palisades Coulee and the former Great Northern branchline climbing from the Columbia River mainline connection to the wheatfields of Douglas County en route to Mansfield. Two former Northern Pacific GP9's have in tow a healthy string of empty 40' boxcars, bound for wheat loading on the branch, which only saw seasonal use. A couple miles ahead, the geeps will buckle down for a climb up the 2.2% grade in a narrow canyon to Douglas. This line only has a few years of intermittent service left before abandonment." I thought it was called Moses Coulee? You are indeed right. I merely went with the caption Blair wrote.